God's Faint Path › Are You Windfirm? My wife Genie and I spend summers and winters at our cabin in the mountains above Boulder. One winter morning, as we skied back to the cabin, Genie saw a large tree that had blown over our property line. The tree stood in a grove of aspens. It probably fell during a storm because I had removed a dozen close-by conifers from the aspen grove last summer. We were reminded of an argument local residents made as the forestry service planned to thin the National Forest around our property for fire mitigation. It seems the last time they thinned up here at 9,000 feet, most of the trees left standing blew down the next winter. Their roots were too shallow to withstand the full force of the wind. How Deep Are Your Roots in the Community? The sight of that majestic tree, fallen over but not yet dead, started me thinking about the roots pastors put down as they start life in a new community. It takes time to put down roots. Slowly, the roots deepen. Over time, you develop windfirmness. In the meantime, turbulence in the community brings great risk to the pastor. However, there is another way. If you surround yourself with lay leaders and build trust, you won’t stand alone to take the full force when the storms blow. Lay leaders already have deep roots. Earn their trust and you will find shelter in a storm. Our cabin is in a montane zone (8-10,000 feet elevation). Ponderosa and lodgepole pines predominate, with scattered aspen groves. Each of these trees has adapted to the environment, with specific strategies to withstand fire and storm. Lodgepole pines grow to 75 feet in dense stands, each taking some of the wind load during a storm. The community recommended that the thinning be done in stages, not in one fell swoop, leaving just a third of the trees standing. Neighbors argued that these trees would need years to develop roots strong enough to survive the wind. I looked for a definition of this term, windfirm, that I had heard in forestry service meetings. Wikipedia was no help. I did find an answer in the Woodlands Expert Answers. They defined windfirm as the ability of the root system of a tree to withstand wind pressure and keep the tree upright. Keep the tree upright. I have seen several trees fall over up here and live the rest of the year. The root is not completely severed, and the tree does not seem to know it’s dead. The process of toppling a leader rarely happens overnight. The cumulative pressure of the storms finally does enough damage to make the result inevitable. The process is often drawn out in the church, sometimes extended by leaders who “quit but don’t leave,” as my friend Robert Fritz likes to say. In other cases, I’ve seen lay leaders lose faith in their pastor but refuse to confront the issue. Avoidance is common. They wait until the financial situation deteriorates until it appears there is no choice. Then they can’t be blamed for the pastor’s departure. Lodgepole pines live and die in a dense stand together. “Lodgepoles want fire,” the specialist from the USFS told me. “Their cones lay dormant for years and only open when the temperature exceeds 700 degrees.” Fire in a lodgepole forest is a “stand-clearing event,” as the foresters say. The ones on Burnt Mountain are all about 90-100 years old (wonder where they got the mountain’s name). They are so dense no light reaches the forest floor, and very little wildlife lives in such a place. Then fire comes, wipes out the entire stand, and the cones open and another cycle begins. Because the fire cycle was interrupted over the last century, the forests are not healthy. Every fire becomes catastrophic because there is so much fuel on the ground. So they want to thin the forests to restore health; hence the debate about windfirmness. Ponderosa pines, on the other hand, are scattered sparsely in open meadows and hillsides, growing quite tall and standing majestically against the backdrop of the mountains. Ponderosas survive by growing a thick bark, letting the lower branches die off and fall from the tree. When fire comes, the bark protects the tree, and the fire stays on the ground. We found one in our meadow that survived the fire many years ago that took out the lodgepoles nearby. It had a scar where the bark had been burned away, but the tree survived. 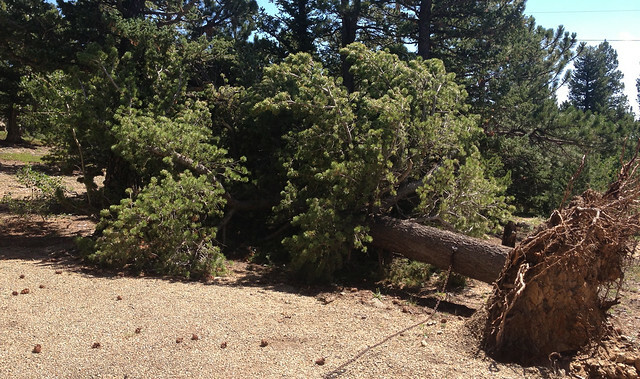 Ponderosas stand alone, with deep roots, taking the full force of the wind. As long as they remain healthy, they can stand alone, even when winds top 100 mph. Lodgepole and ponderosa pines share our mountainside with the aspens. Each copes differently with the same environment. Unlike the stands of pine, an aspen grove is actually one organism. Its roots spread out and send up shoots to become new trees, replicating its DNA across the hillside. The power of the aspen is in its root system. While the pines each have a mechanism to deal with fire, the aspen trumps them all. The root system of the aspen grove has so much energy stored up that a fire that burns the trees to the ground will just spark new shoots coming up from the roots. The plant survives. I cut some six- foot saplings out of a trail and within three years, there were six-foot saplings again. Like the aspens, healthy missional leaders create a discipleship DNA at the core of the church. It radiates outward, replicating the DNA as it spreads through networks of friends and family. Each family that moves takes the DNA into its next community. The DNA is no longer dependent on one leader, but is the culture of the Body of Christ. Now it has the strength to cope with the worst firestorms that might pass by, because at its very core is the DNA of discipleship. I have known several pastors who have served long and well, loving and being loved by their community. Some have stayed 25 years or more at mission churches they launched. They have deep roots; they are windfirm. While they might be solitary leaders who are reluctant to share leadership with the laity, they can survive any storm due to the reservoir of goodwill established over the years. I know others who have entered new communities and tried to move ahead with new ideas and attempt to change the culture in the first year of their tenure. Sadly, these actions often come before they have developed a core of leaders who share a relationship of trust. I have seen these actions ignite a firestorm that does great damage to the leader and to the community. Everyone is stained by conflict, no matter how pure his or her motives might be. This assumption is built into our Transforming Leaders Initiative Learning Journey. We are intent on building a healthy Body of Christ at the core of participating churches, honoring the priesthood of all believers and the idea that each of us has a calling and vocation in the church and in the world. In my father’s day, the solitary leader atop an organization was the norm. As my brother and I built upon my father’s legacy in the company, we moved to a participative management model. We involved people at all levels of the organization in coming up with strategies to better serve our customers, our vision and our mission. Towards the end of my time there, I reorganized my division into a team-based organization and did away with the hierarchical organization built during my father’s time. It was during my time in the GSU Executive MBA program that I experienced working in a collaborative team for the first time in my life. I came away with a desire to work the rest of my life in such a setting. Once we made the shift to team at the company, the gains in productivity, creativity and problem-solving to better serve the customer were astounding. The move from solo to collaborative leader was a difficult journey for me and for the organization. We invested tremendous time, resources and energy into the redesign, into retraining and equipping people to work in this way. If you look across the corporate world, you will see these collaborative environments being replicated everywhere. I find few churches willing or able to invest the leadership time and energy to revisioning and reinventing their community, instead clinging to forms whose utility has exceeded its shelf life. In my personal experience, the toll on leaders who attempt transformation wears down the strongest, unless there is a core of supportive leaders sharing the load. Why Are Churches Late Adopters? Most new forms of organization emerge first in academic research and study. I remember reading a book on this topic 20 years ago. The author described a lag time of about 20 years between the discovery of a new way of organizing people and work to the time it is widely adopted in the world. Peter Senge wrote a revolutionary book in 1990 called The Fifth Discipline. This book described the disciplines of the learning organization, and shared leadership is at its core. Senge had a great passion to bring this work into the nonprofit and government worlds. What he found was no one cared. So he shifted his focus to private industry. What he discovered is that business has a much greater sense of urgency to adapt to meet the changing world. As I have worked with churches, I have found strong evidence to back up Senge’s findings. Any business, no matter how large, is never more that three years away from failure. The pace of change is battering the slow to adapt, and there is little room for late adopters. Churches, on the other hand, take 20 years to die. You can hardly kill them. Hence, the sense of urgency to adapt to a changing culture and context is very weak. There is a New Operating System Available. Would You Like to Download? Today we find most Lutheran churches operating with a Council/Committee structure that was created in the '50s and '60s. If this operating system were still effective, we would not find 80% of our churches on plateau or in decline. These cultures have become very resistant to change, and any attempt to create healthy change will spark turbulence. Many, perhaps even a majority of pastors, do not see their role as leader, at least in the sense of any secular definition of leadership. I was confused for several years by the way we use “leader” synonymously with “clergy” in the ELCA. Hence, many congregations have never seen a pastor who exhibits the courageous leadership so evident in the early church. When a new pastor comes, she will pay a dear price for any attempt to shift the culture before developing windfirmness. For this reason, a centerpiece of our Learning Journey is the development and support of lay/clergy shared leadership in the local congregation. Once a strong core leadership begins to share a vision of discipleship community, they can move together, knowing that they will give each other the strength to survive any storms that come. As Dan Southerland writes in his book Transitioning, the difference between a leader and a martyr is two steps. A leader stays one step ahead of the people. A martyr gets three steps ahead and gets shot in the back. For further development of these ideas, see the article Declaration of Interdependence.